The Cypriot broadcaster CyBC confirmed a month ago that it will be the Albanian-born, Greek superstar Eleni Foureira who will represent Cyprus at Eurovision Song Contest 2018. One of Eleni's biggest dreams is to be on the stage of Eurovision Song Contest. And after several previous attempts representing Greece, she was picked by Cyprus. And now her song Fuego has been released, standing in a bathing suit with her duvet in front of polluting black smoke from burning oil. 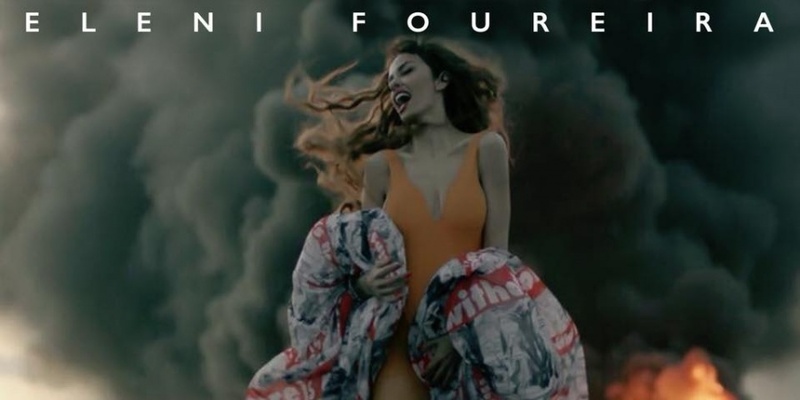 Eurovision 2018 Cyprus: Eleni Foureira - "Fuego"
Fuego is composed by the Greek-Swedish composer Alex P (Alex Papaconstantinou), Geraldo Sandell, Viktor Svensson, Anderz Wrethov and Didrick. The staging of the entry has been assigned to the internationally acclaimed artistic director and choreographer Sacha Jean-Baptiste from Sweden, who has extensive experience at Eurovision Song Contest. Eleni Foureira (Ελένη Φουρέιρα), 30, was born in Fier, Albania, and now lives in Athens, Greece. She started her career in 2008 as a member of the girl band Mystique. She released her first solo album in 2010, and has had huge success ever since with three albums and more than ten singles. Eleni has tried to represent Greece in Eurovision Song Contest a couple of times before. In 2010 with the song "I kyvotos tou Noe" together with Manos Pyrovolakis, but finished 2nd in the Greek selection (Giorgos Alkaios won with "OPA"). In 2016 she was in the run for representing Greece, but the Greek broadcaster ERT picked internally the group Argo – the only time Greece didn't qualify for the final. In 2015 she had a great hit in Greece and Cyprus with Israel's Eurovision song Golden Boy – in a Greek version: "Sto theo me paei". The Cypriot broadcaster had earlier planned audition rounds and a live show to select the artist for Eurovision 2018. The selection show was scheduled to be broadcast directly on RIK TV, with the contestants performing songs assigned to them by RIK. The winner of the show should have been selected by a combination of jury and televoting. It is still unknown why RIK apparently has chosen to cancel the national selection process and select an artist internally instead. Eurovision 2017 Cyprus: Hovig - "Gravity"
Since Cyprus debuted in Eurovision Song Contest in 1981, the country has not yet managed to win in any of the 34 times the country has participated. Since the introduction of the semi-finals in 2004, Cyprus has qualified for 7 out of 13 Grand Finals. Best position is three fifth places (1982, 1997, 2004), and the worst is last place in 1986.